Enjoy this baked potato with a seasonal salad of grated carrots with sultanas and a simple dressing of olive oil and lemon juice. Bake potatoes at 180°C until cooked through. To save time, microwave for about 5 min first, then finish off in the oven (do not forget to pierce the potato’s skin regardless the way of cooking you chose). Cut the top off the potatoes and scoop out flesh. Mix the potato flesh with the other ingredients and spoon (or pipe) back into the potatoes. Return to the oven for approx. 20 min until golden brown. 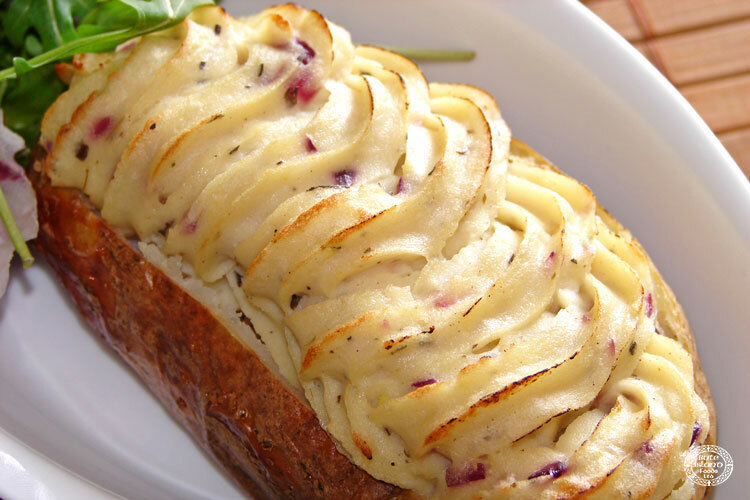 You can top the filled potatoes with sliced tomato for instance. Serve with salads or steamed vegetables.